Peugeot pepper and salt mills have been in our selection the longest time of any brand, quite simply because of their mechanisms’ proven performance and longevity in both home and professional kitchens. It’s no wonder that Peugeot mechanisms are guaranteed for life. Peugeot Pepper Mills utilize case-hardened steel, Peugeot Salt Mills use corrosion resistant materials including stainless steel. Pepper mills use durable case-hardened steel, with exacting machining for long term performance. Through case hardening, the grinding head and ring are tempered to the point where they becomes as hard as a ball bearing. 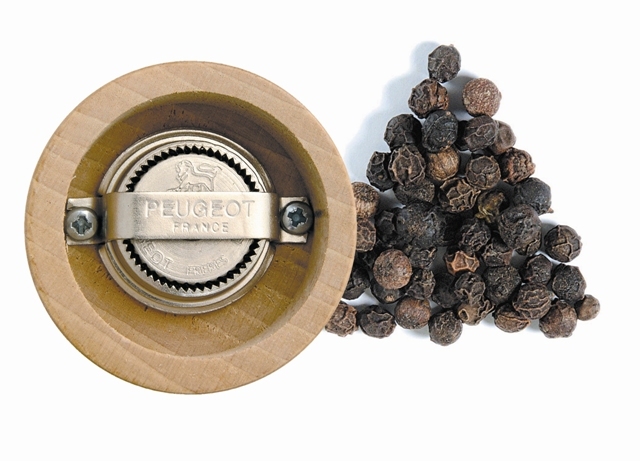 The Peugeot pepper mill mechanism has two different size grooves both in the outer ring and on the grinding mechanism. The burrs of the channeling grooves are larger and designed to line up the peppercorns into the channel and then crack them. The burrs of the grinding grooves are smaller and do the fine grinding. Turning the mechanism in a clockwise direction insures the speed and efficiency of the channel design. The burrs in the outer ring and on the mechanism are designed in different directions, so they will not lock together. The grooves are still cut with the design techniques that were first utilized around 1840, when the mechanism was created by the Peugeot brothers for coffee mills, and adapted in 1874 to make the first pepper mills. 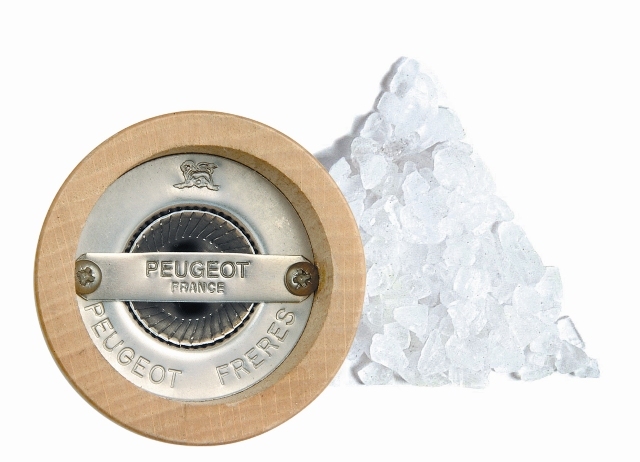 The durability of these mechanisms and their proven track record allows Peugeot to provide a lifetime limited guarantee on the grinding mechanisms, even when used commercially. Note that rust is not covered under this warranty; prevent rust by keeping your mill dry and don’t use it for salt. Salt mills use a commercial grade 18/10 stainless steel that is used in the chemical industry, to help keep the salt from corroding the grinder mechanism. It is also further treated to prevent corrosion. Developed in 1995, the stainless mechanism in salt mills is guaranteed for life. Hardened steel vs. Stainless steel. For pepper mills, case-hardened steel is preferred over stainless because of its greater hardness, and therefore its ability to maintain sharp burrs over a much longer period of time than stainless. Though hardened steel can rust, under normal use a pepper mill will not come in contact with water to make it rust. For salt, however, never use a hardened steel mill, since salt is highly corrosive. Physical Vapor Deposition, or (PVD), is used to treat mechanisms for pepper mills. PVD is a group of surface treatments at the atomic level that add surface protection and resistance to wear. The process is similar to electroplating, but without any chemical reaction, less hazardous materials and waste, and is thus more environmentally friendly. PVD can be used on most metals, and even some plastics, and include treatment by the addition of metal oxides, nitrides, carbides and other such materials to the surface. In thin layers, PVD can replace some painting applications for decorative purposes. PVD is generally highly abrasion resistant, has a high temperature strength, and can be harder and last longer than hardened and stainless steels. Filling – Remove the adjusting nut and cover to fill, then replace cover and nut. Turn mill upside down to get peppercorns or salt away from the burrs, then turn top nut clockwise to tighten loosely. Turn upright, then turn the mechanism in a clockwise direction to grind. With pepper mills, only use hard, fresh peppercorns, or combinations in which the hard seeds are dominant. With regular salt mills, only use dry salt crystals appropriate for grinding. With wet salt mills, only use wet salt crystals appropriate for grinding. The Grind – All mills are easily adjusted for different size grinds. Loosen top nut (counterclockwise) to obtain a coarser grind. To return to a finer grind, turn mill upside down and turn the mechanism counterclockwise a bit, to get peppercorns or salt away from the burrs, then loosely tighten top nut to desired fineness. The closer the turning burrs are to the outer ring, the finer the grind. Warranty – Peugeot mechanisms are clearly identified by the name imprinted on the mechanism. The lifetime warranty on pepper mills and salt mills covers defects in manufacturing of the mechanism. The warranty also covers the mechanism against wear. 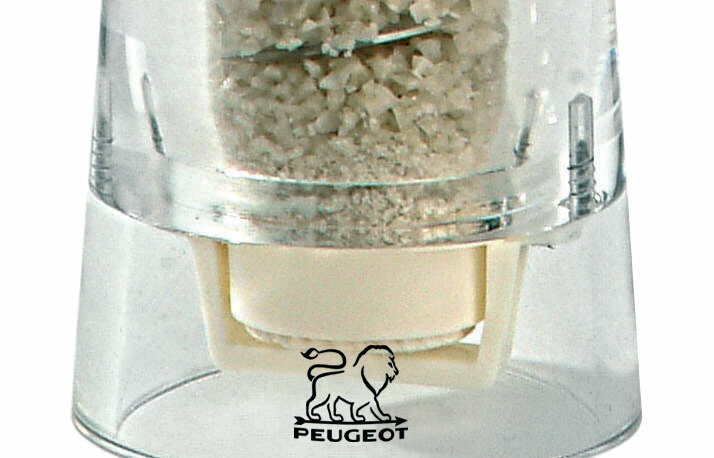 A 2-year warranty applies to the body of PSP USA Peugeot mills against any manufacturing defects. Keep the mills out of water, or the mechanism may rust and wood may crack; neither rust nor other preventable metal or wood degradation are covered under the warranty. Old peppercorns. If pepper has been in the mill for a long time, the peppercorns may have become soft and possibly moldy, or they may have caked in the mechanism, preventing grinding. We recommend taking it apart for cleaning, by removing the two very small bottom screws; remember how it comes apart, for ease in putting it back together. Clean out the mechanism and the hollow of the wood. You might use some rubbing alcohol to clean the wood. Make sure you dry the mechanism well. Allow the wood to dry thoroughly before reassembling. And always use fresh peppercorns. Peppercorns that are too large. If they can’t fit in the wide part of the mechanism, it can’t grab and crack them. A little bit of pepper might come out, but not much. We recommend removing all the peppercorns, and reinserting only the smallest ones. Grind and see if that made the difference. Too fine a setting. We recommend unscrewing the top nut about a quarter to half turn. It may take a turn or two for the remaining fine grindings to come out of the mechanism. If you purchased the mill from Fante’s and all the above are ruled out as causes of any problems you may be experiencing, then you may wish to return the mill to us. We’ll let you know if the mill mechanism is found to not be defective (perhaps just in need of normal maintenance), in which case a modest return shipping charge of $5 to $10 (depending on shipping weight) will be billed prior to its return. For freshness, use pepper a lot and it won’t go stale. If you don’t use a lot, only keep a small amount in your pepper mill, check it and replace it frequently. Store fresh peppercorns in an airtight container, away from direct sunlight. Salt doesn’t go stale, however it does pick up moisture easily, so store salt in a dry location. Clean the mechanism using a thin brush Wipe the body of the mill with a towel moistened with rubbing alcohol or window cleaner, and dry thoroughly. Unless the instructions specifically allow it, never place your pepper or salt mill in water. Adjust the grind to make it coarser by turning the model’s appropriate screw or mechanism. To make it finer, it works best when you remove peppercorns from the mechanism: turn the mill upside down, and turn the mechanism in the opposite direction to release pepper or salt from the grinding mechanism. In a pepper mill, only grind hard peppercorns. Salt is highly corrosive, and it can easily corrode steel mechanisms, so it should never be used in a pepper mill. Soft peppercorns, like the green and pink varieties, can clog the mechanism, so they should only be used when they are outnumbered by hard peppercorns. And some varieties are too large for any mill, and best ground in a mortar and pestle. In a salt mill, only use dry salt crystals intended for grinding. Wet salt crystals will clog mechanisms intended for dry crystals. and should only be used in mills intended for that purpose. Peppercorns are the berries of the climbing Pepper Plant (Piper nigrum) vine. Black – Berries that are picked just before they mature. When dried, they form a wrinkly skin. Black peppercorns have the strongest flavor. Malabar are regarded as having the finest flavor of the four mass-produced peppercorns; the others being Lampong, Brazilian and Sarawak. Tellicherry is a higher quality grade of Malabar. Tellicherry are larger, more mature, with a fuller flavor. White – Allowed to ripen longer on the vine, then soaked with water, the black shell of the peppercorn becomes loose and is removed to produce a pepper that is less noticeable in light colored foods, but that also gives it a rich, lightly-fermented flavor very prized by European cooks. Commonly called for in white sauces. Green – Berries that are picked when very immature, resulting in a very light flavor. Packed either dry or with liquid, the dry having the better flavor. They can be ground in a pepper mill or even crushed between two spoons. Their fresh flavor combines especially well with fish, poultry, eggs, salads and steamed vegetables. Pink or Rose – Not peppercorns, but berries of the Baies rose, which are similar in size and in flavor, from Madagascar. Introduced to America by the French nouvelle cuisine in the 70’s for most everything; from chicken to salad to seafood. These berries add a touch of color and a rich, sweet flavor to most dishes. Royale – Superb Black and White from the Far East, Green from Brazil and Rose from France, blended to represent the aristocracy of taste. A zesty mix for marinades, sauces and for their exquisite touch of color and taste on vegetables. Superior bouquet, rich flavor and handsome bold berries. Recommended for entrees of beef. From the northwest coast of India. Excellent flavor, aroma and pungency. Recommended for entrees of pork. From the southwestern Malabar coast of India. A fine, delicate peppercorn, light, mild flavor. Recommended for entrees of veal or poultry. The delicate insides of shelled black peppercorns. Light flavor with a characteristic aroma. Recommended with entrees of poultry and seafood, or light sauces. Unripe black peppercorns. Light and spicy with fruity sharpness. Recommended for entrees of veal and specialty meats, usually added whole. From the fertile Amazon rainforest. If you intend to grind Green Peppercorns in a pepper mill, always use with black or white peppercorns. Mild, sweet and tangy flavor. Recommended for entrees of veal or delicate specialty meats or seafood. Crush with a fork or add to peppercorns to grind in mill. From the island of Madagascar. If you intend to grind Pepper Rose` in a pepper mill, always use with black or white peppercorns. Black, white, pink and green peppercorns for a confetti of color and flavor. From India, Brazil and Madagascar.